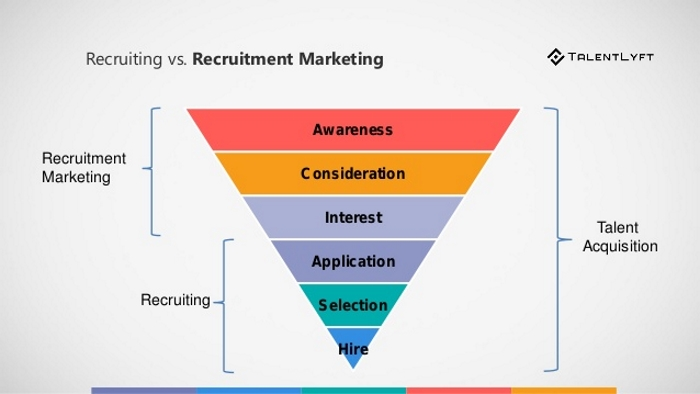 Recruiters and marketers have much in common. Check out our infographic which shows 11 main similarities between recruiters and marketers. If you want to be a successful recruiter, you should start thinking more like a marketer! What do recruiters and marketers have in common? Recruiters and marketers have very much in common, and similarities are getting more and more obvious every year. With that, recruiting trends are changing dramatically. ➡️ Download our free eBook: 15 Recruiting Trends You Should Implement in 2019! Why are recruiters’ and marketers’ jobs so similar? The labor market is way different than it used to be a few years ago. The economy has recovered from the crisis, unemployment is much lower across the world, technology has advanced, new roles and positions have emerged, gig economy is at its peak. As a result of these changes, candidates’ behaviors have changed as well. Consequently, employers have to adapt to these new trends by implementing innovative recruiting strategies. The same way marketers promote and sell products and services, recruiters have to sell their job openings. Marketers’ goal, when promotion products and services, is to make their ads and promotions as attractive to potential buyers as possible. Same is with job openings. Recruiters need to have a well-planned job promotion strategy and apply the best job advertisement practices in order to attract job candidates. Before marketers even start planning their marketing strategies, they have to define their buyer persona. Why is this important? In order to attract buyers, marketers need to send them personalized messages, create personalized content and deliver personalized ads and promotions. This is impossible without knowing who their ideal customers or buyer personas are. Besides defining buyer personas, marketers need to be well aware of what value their products and services bring to potential customers. They have to define the benefits and advantages of what they have to offer compared to their competitors. Take for example, McDonalds and Burger King. Their main advertising strategies are to differentiate themselves from one another and make fast food lovers choose their food over competitor’s. 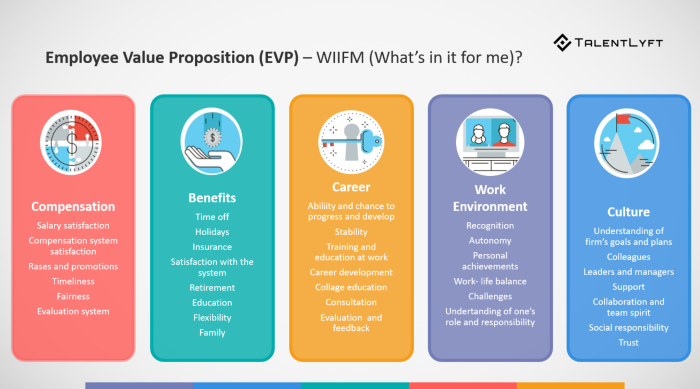 In order to attract candidates, recruiters need to have a clearly defined Employee Value Proposition - set of values that employer offers to their employees. There are 5 main blocks of EVP (see the picture below). The first 2 blocks might be the 2 most important EVP factors in the past. Today, however, employers focus more on the last 3 blocks as they have become more important to job seekers. While they search for a certain product or service, customers go through a journey called buyer’s journey. In general, the harder buying decision, the longer the journey. Marketers are well aware of all stages of their buyer persona’s journey when researching and buying products and services. Changing and choosing jobs and new employers is a hard decision to make. Consequently, candidates go through a long candidate journey that consists of 6 main stages: Awareness, Consideration, Interest, Application, Selection and Hire. In order to send the right message, to the right candidates at the right time, recruiters have to be aware of the stage in which their candidate persona is. When promoting products and services, besides knowing in which stage of the buying process their buyer persona is, marketers also have to know which channel of communication to use. 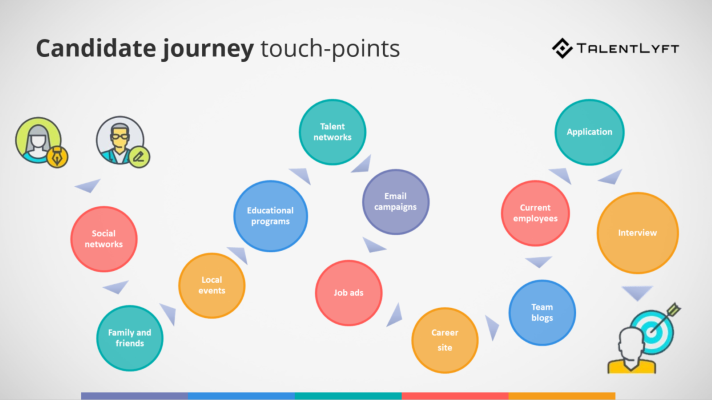 Customer touchpoint is a representation of any kind of a connecting with customers throughout their candidate journey. Social Media advertising is an important marketing strategy for every marketer. Why? Because potential buyers spend a lot of their time on Social Media on a daily basis. Well, job candidates do as well. Promoting job ads and Employer Band on Social Media has become a must-have recruiting strategy. Unlike job boards, Social Media is a great way from increasing brand awareness and getting in front of both active and passive job seekers. In addition, recruiters more and more use Social Media to source job candidates. Managing relationships with customers is in the center of many marketers’ success goals. This is true not only in the pre-buying stages of the buyer’s journey, but also after the purchase happens. A proper, timely and relevant flow of information between the marketers and buyers is crucial for every company’s success. Same is with candidates. Successful recruiters build relationships with job candidates throughout their journey which significantly increases candidate’s experience and satisfaction. As a result, recruiters get awarded with much higher offer-acceptance rates and reputable Employer Brand. Marketers know that pitching their products and services to potential buyers is not enough anymore. They now need to be able to create informative and relevant content and offer it to the potential buyer. Depending on the stage of a customer’s journey, marketers need to know exactly what type of useful and relevant information their buyer persona may find useful. Recruiters have also started applying inbound recruiting methods to their talent acquisition strategies. Creating useful tips for job seekers, holding informative webinars, organizing local educational events, creating videos with employee testimonials, writing blogs with employee stories and interviews, creating job description infographics...are all examples if inbound recruiting content. The brand is very important when it comes to selling products and services. Companies with a more popular brand have to put much less effort when trying to sell it. These brands have their influencers who have a huge impact on fans buying decisions. 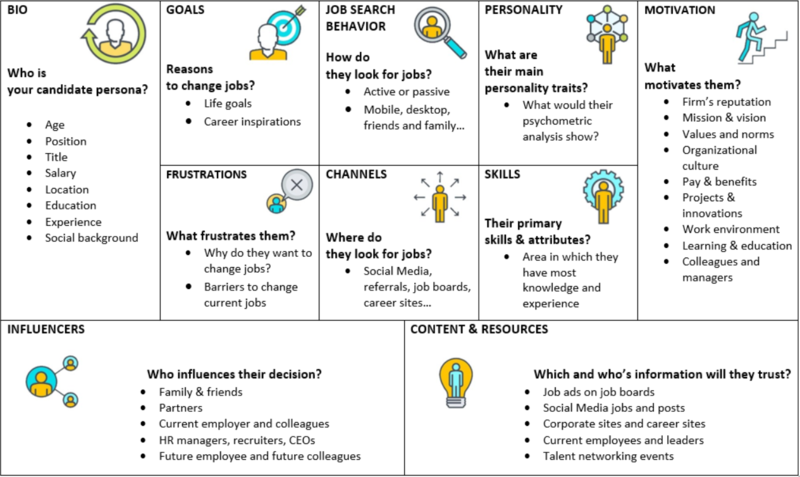 The situation with employers is no different - they also need to plan, develop and implement an employer branding strategy. Recruiters say that Employer Brand and reputation have a huge impact on their ability to attract and hire talent. The stronger the brand, the more talent wants to join. 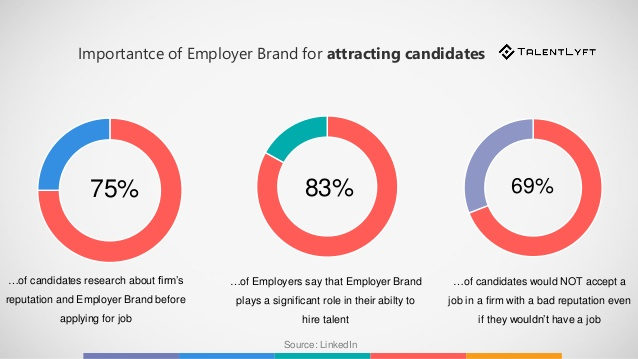 Here are just a few stats about why Employer Branding plays such an important game when it comes to successful hiring. Marketers measure every step of their marketing strategies. There are so many different marketing tactics today. To be able to understand which ones are working and which ones are not, marketers need to continuously measure their efforts. With the emergence of new HR technology, this is now possible in recruiting as well. Successful HR professionals measure every step of their recruiting and hiring efforts in order to make better hiring decisions. While cost, time and quality of hire were the most important metrics in the past, many new recruitment metrics have emerged. Canva, Buffer, SEMRush, HubSpot, Salesforce, Mailchimp...are just some of the must-have marketers’ tools. Without these tools, marketers simply can’t do their jobs properly, and their productivity suffers. Even though this may sound scary to many recruiters and HR professionals, new technologies are coming to HR as well. This technology, however, will not replace humans, as some people are scared about. They will simply make recruiters more productive and more competitive. Different type of HR software such as Sourcing tools, CRMs for recruiters, Recruitment Marketing platforms, Video Recruiting tools, modern Applicant Tracking Systems, Referral tools are just some of the examples.